First there was Tulip Mania. Then there was the dotcom craze. And let's not forget the run-up in housing prices. The newest bubble on the block is in Bitcoins, a 4-year-old virtual currency that has already increased ten-fold this year. And like all other bubbles, this probably won't end well for any investors who jump in way too late. Prices have nearly doubled during the past two weeks, and show no sign of slowing anytime soon. "It is rare that we get to see a bubble-like phenomenon trade tick for tick in real time," said Wall Street veteran Art Cashin in a recent note to clients. "But all that may be changing -- before our very eyes -- quite literally." According to Jesse Colombo, an independent financial analyst and investor who keeps close tabs on bubbles at TheBubbleBubble.com, the Bitcoin bubble is currently in a mania phase. "We're beyond the point where Bitcoins are only talked about among the early adopters, like tech geeks," said Colombo, who warned in early 2004 that the housing bubble and banking bubble would trigger a financial collapse. "Bitcoins are getting a lot more media attention and we're seeing a lot of enthusiasm, greed and delusion." The buying frenzy has pushed the value of total Bitcoins to more than $1.4 billion, up from less than $150 million at the beginning of the year. The currency really gained attention, and traction, in the wake of a mini-bank run in Cyprus that raised concerns about the health of government-backed paper currencies like the euro and dollar. 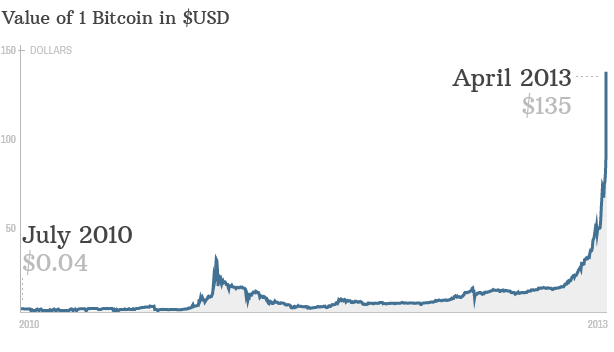 But Colombo says that's not enough to justify the parabolic rise in Bitcoin prices. "I could understand a long-term uptrend based on worries about paper money," he said. "But there's no real catalyst for the market to go up as vertically as it has." If the Cyprus crisis was the true spark, Colombo said he would expect gold and silver prices to rise in tandem, but that hasn't been the case. Gold prices have actually retreated this week, falling to a ten-month low. While Colombo doesn't believe the Bitcoin is doomed to fail, he expects prices to retreat back to pre-mania levels -- less than $15 apiece. It's hard to predict when investors will realize they're paying too much for Bitcoins, but it won't take much for prices to drop quickly. Given that the Bitcoin market is small, all it could take is just one large sale to give investors a reality check, said Colombo.